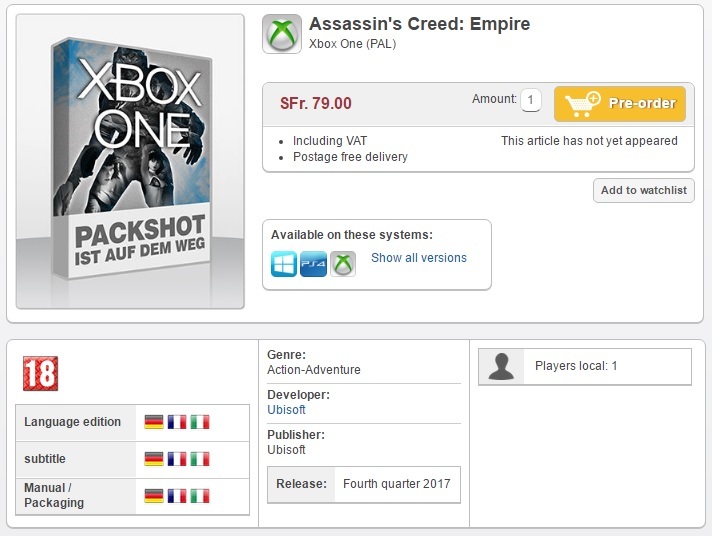 Assassin's Creed Empire has been listed at a Swiss retailer with a Q4 2017 release date. Read more on Assassin's Creed Empire. Never played one of these. I kinda feel like even two years between releases can't get rid of the AC fatigue. Assassin's Creed is one of the most overrated games. People still flock in droves to play the same thing with just different model architecture and NPC attire. Assassin's Creed is basically a demo of historic architecture. I tried to play AC: Black Flag, but just couldn't get into it. Too console-ish for my tastes. How deep into the ground can we run this franchise? Only yesterday i figured out that the movie has already been released and apparently even that is set up for a sequel. I read that the movie's main goal was to publicise the game further. It's not a creative ensemble working together towards a complete product; it's a manufacturing plant posing as a craft. Have not even played 1 of them.... and I have like 3 assasin creed games in my library. Maybe I should give it a try and see whats all the fuss about.